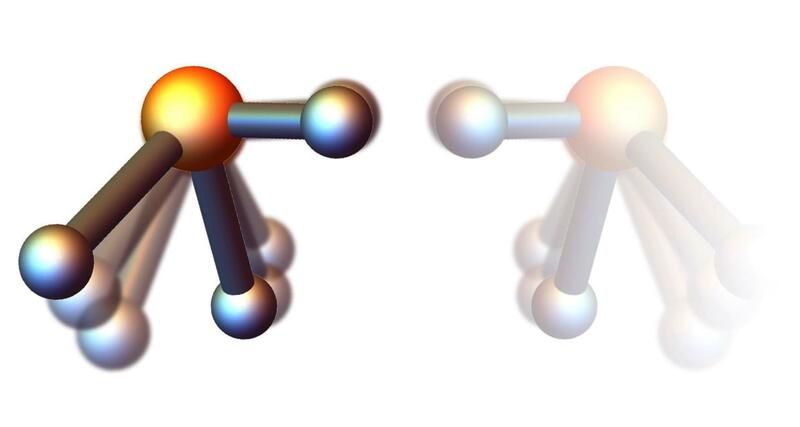 Küpper's team has now computationally devised a way to achieve this rotationally-induced chirality with realistic parameters in the lab. It uses corkscrew-shaped laser pulses known as optical centrifuges. For the example of phosphine (PH3) their quantum-mechanical calculations show that at rotation rates of trillions of times per second the phosphorus-hydrogen bond that the molecule rotates about becomes shorter than the other two of these bonds, and depending on the sense of rotation, two chiral forms of phosphine emerge. "Using a strong static electric field, the left-handed or right-handed version of the spinning phosphine can be selected," explains Yachmenev. "To still achieve the ultra-fast unidirectional rotation, the corkscrew-laser needs to be fine-tuned, but to realistic parameters." This scheme promises a completely new path through the looking-glass into the mirror world, as it would in principle also work with other, heavier molecules. In fact, these would actually require weaker laser pulses and electric fields, but were just too complex to be solved in these first stages of the investigation. However, as phosphine is highly toxic, such heavier and also slower molecules would probably be preferred for experiments. The proposed method could deliver tailor-made mirror molecules, and the investigation of their interactions with the environment, for instance with polarized light, should help to further penetrate the mysteries of handedness in nature and explore its possible utilization, expects Küpper, who is also a professor of physics and of chemistry at Universität Hamburg: "Faciliating a deeper understanding of the phenomenon of handedness this way could also contribute to the development of chirality-based tailor-made molecules and materials, novel states of matter, and the potential utilization of rotationally-induced chirality in novel metamaterials or optical devices." DESY is one of the world's leading particle accelerator centres. Researchers use the large-scale facilities at DESY to explore the microcosm in all its variety – ranging from the interaction of tiny elementary particles to the behaviour of innovative nanomaterials and the vital processes that take place between biomolecules to the great mysteries of the universe. The accelerators and detectors that DESY develops and builds at its locations in Hamburg and Zeuthen are unique research tools. DESY is a member of the Helmholtz Association, and receives its funding from the German Federal Ministry of Education and Research (BMBF) (90 per cent) and the German federal states of Hamburg and Brandenburg (10 per cent).